PokeBeachHey guys, Celebi’ here. Now, I’ve had some trouble finding a card to review, since nobody has requested anything recently. After scrolling through all the current sets many times, the card that caught my eye was…Smoochum. I think that Smoochum might have a use in MewBox. This deck is not quite mainstream, but at the same time, it’s not “crazy” enough to be a rogue. It uses Vileplume to Item lock and Mew Prime’s “See Off” to put Pokémon like Jumpluff HS and Muk UD into the Lost Zone; Mew then can use their attacks. MewBox often uses Aipom UL to stall the opponent. 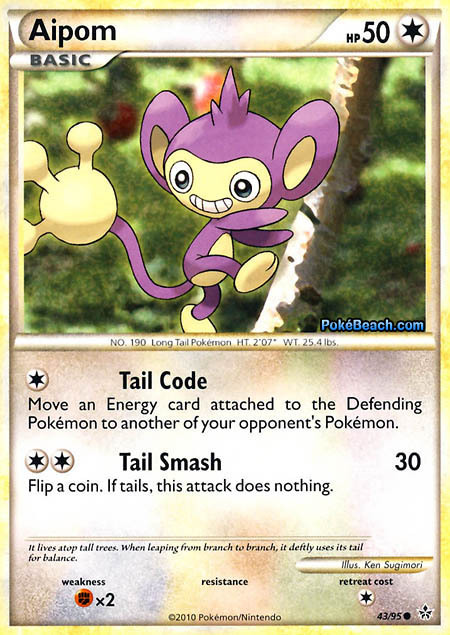 Aipom’s first attack, Tail Code, lets you move an energy attached to the Defending Pokémon to another of your opponent’s Pokémon. This can literally stop your opponent for the rest of the game. Say your opponent has a Magnezone active with only one energy on it. You can use Tail Code to move the energy to a useless benched Pokémon such as a Cleffa. They attach next turn, then you move it away. Lather, rinse and repeat. They’ll never get 2 energy on the Magnezone, and you just wall them from doing anything. Aipom is a really fun card to play with (but not to play against). However, it has a couple of downsides. First, it has 1 retreat, forcing you to waste your energy attachment for the turn if it gets Catchered up. Second, it has a Fighting weakness, which makes it terrible against Donphan (which only needs one energy to attack, making Tail Code ineffective, and it can OHKO Aipom) as well as Phanpy, which can OHKO Aipom as long as Phanpy has 30 damage on it. Another option could be Smoochum. She has the usual baby Pokémon stats: 30 HP, the Sweet Sleeping Face Poké-Body, and no weakness, retreat, or resistance. She also has the typical zero-energy attack. Smoochum’s attack, Energy Antics, lets you move an Energy card attached to one of your opponent’s Pokémon to another of their Pokémon. Smoochum then falls asleep. PokeBeachThis means that there’s a 50% chance that Smoochum will be invulnerable next turn, if you hit tails on the coin flip. Now, because you moved the energy to another Pokémon, there’s not a very big chance you’ll even be attacked, but it’s always nice. Also, free retreat is quite useful because you won’t be stuck if you start with Smoochum. On the other hand, Aipom is a terrible starter. Of course, Smoochum does have its downsides. First, it has only 30 HP (20 less than Aipom). This means that there’s a big chance of getting donked if you go second. Also, if you do use Energy Antics but flip several tails, Smoochum will be stuck in the active spot, forcing you to burn a Switch. 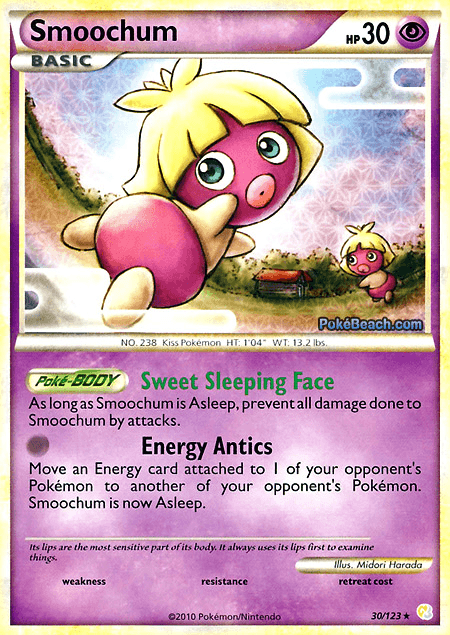 I’m not necessarily trying to hype Smoochum as a better card than Aipom, but I think it might have some potential. MewBox is an interesting new deck and Smoochum might be able to help it out. What do you guys think? I’m really not liking this review. You forgot to mention that MewBox (the only deck Aipom is really viable in), particularly those making use of Muk’s Sludge Drag, have Vileplume to stop the opponent from Switching that Magnezone back out. You basically acted as if both Vileplume and Switch didn’t exist. You even mentioned that Aipom has big issues being Catchered out (which can’t happen under the Vileplume lock), though instead of talking about how its 50 HP ensures a quick KO, you talk about its 1 retreat (which isn’t particularly high) being an issue. Same goes for the Fighting weakness. You mention it’s bad versus Donphan, but again, it only has 50 HP. Donphan could kill two Aipom with one Earthquake if the mechanics allowed it (you’d think they would, with that attack name). Thankfully you also mentioned Phanpy, but honestly Phanpy nor Aipom are made for attacking roles, and if you use Aipom’s second attack on a Flail Phanpy, you deserve to lose regardless. I know this is Smoochum’s CotD and not Aipom’s, but Aipom took up about half of it, and the same issue as earlier arises when you talk about Smoochum. Again, the only deck you should be playing these in is a Vileplume deck. There would be no Switch. I don’t believe any other deck should be running Smoochum. Babies are a risk as it is, and if you’re using more than just 1 Cleffa it should be Tyrogue. Pichu for those Oddish/Solosis parties if you’re into that, but that’s a Vileplume deck anyhow. I do think Smoochum and Aipom are about equally viable for Mew/Vileplume decks, particularly because Smoochum uses up no energy to attack or retreat. Not that the deck needs a lot of Energy attached (Yanmega attacks for free, Mew and all its LZ targets need 1 Energy generally), but you might have to swap around a lot between Aipom and Mew/Yanmega depending on where your opponent attaches Energy, and being forced to attach to Aipom can be a pain. Especially if you have to match hand sizes for Insight. So yeah, there’s my thoughts on the whole thing. I didn’t like this CotD but I do think Smoochum has potential. Aipom is the play for Mewbox. Smoochums may have potential when sniping is an option and as the game moves to lower E counts, that may make it a good play. People are testing it. However, to me its just bench fodder and I can’t see how it really fits into any deck I’ve played. I disagree. My friend has a really nice rogue deck that uses Smoochum EXTREMELY well, and it doesn’t lock trainers.